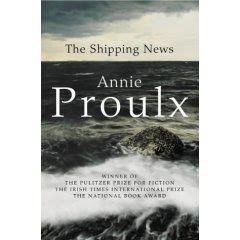 I have been reading Annie Proulx’s short stories with much enjoyment, but kept seeing this novel on the library shelf and ignoring it. Much as I liked her tales, a book about ships, shipping news, stormy seas or widowers moving to the coast did not seem very interesting to me. In the end, the Pulitzer-prize winning tag and the fact that it had been made into a film (which tells you absolutely nothing), reeled me in. The Shipping News is the story of Quoyle, a shy, recently widowed New Yorker and father of two young girls, who is completely lacking in confidence or self-respect. Quoyle’s world is shattered when his cheating, cold-hearted wife is killed in a car-crash, leading to a forceful Aunt he has never met to move in and take charge. She convinces him to move back to the Newfoundland coast where his family originate from and take up a job in the local paper. He arrives to find an eccentric community of sailors and delinquents in which he attempts to rebuild his life, raise his daughters and discover what it means to respect and defend yourself. This book is written in Proulx’s archetypal style - dry, detached, wry, wickedly mischievous at times, occassionally very funny. You feel strongly for Quoyle’s character and Proulx creates a convincing back-story of the way his family and society have managed to turn him into a downtrodden “loser”. His dead wife is suitably horrendous although the Aunt is an interesting creation: strong and decisive on the surface, vulnerable and lonely deep down. I almost felt that this character was a version of the writer herself. At times the book can feel too rambling, too dry and too technical with it’s descriptions of ships, stormy seas and even types of knots. At the other times, some of the characters fall slightly short of convincing, so eccentric and odd are they. Although this book was readable enough, I think I preferred Proulx’s books of short stories which put a constraint on the level of detail she can put in to her writing. In the medium of a novel sometimes it feels as if she is going on too much.